Britain's war effort against France was always hampered by a shortage of cavalry. Pound for pound it was the equal of any, but its lack of numbers was compounded by poor leadership and indiscipline that wasted not only good opportunities, but lives. There were two distinct branches of British heavy cavalry - the Household regiments and the heavy dragoons. The Household troopers, which included the Life Guards and Royal Horse Guards, were little used during the early years of the Napoleonic Wars but some units arrived in the Peninsular War in 1812 and certainly made up for tardiness with their heroics at Waterloo. 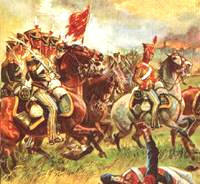 The heavy dragoons included seven regiments of Dragoon Guards and six of Dragoons. Despite the addition of the word guards there was little difference between the two formations. Being large men on large horses, the British heavies were used as shock troops in battle. They would throw themselves into the fray to bolster a weakening line, as at Waterloo, or smash through the enemy formations and rout them. 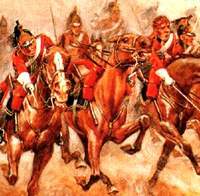 Until 1806, Britain had no real light cavalry and so the duties expected of European hussars fell to the Light Dragoons. Untrained in this role at home, the skills required of light cavalry - patrolling, reconnaissance and screening - had to be picked up while on active duty. The best of the British units was the King's German Legion, which performed excellent service in the Peninsula and created history by breaking French infantry squares at Garcia Hernandez. Hussars became part of the British army after 1806, when four Light Dragoon regiments - the 7th, 10th, 15th and 18th - were styled hussars.